We’d love your help. Let us know what’s wrong with this preview of Midnight Sky by McKenzie Hunter. Being part of the Midwest Pack isn’t easy—especially now. Sky’s life has never been simple—and it only gets more complicated. The Alphas, Ethan, and several key players in the otherworld go missing, thrusting Sky into the position of Elite Alpha and tasking her with finding them. The list of suspects grows as Sky realizes that her mating with Ethan has caused allies to bec Being part of the Midwest Pack isn’t easy—especially now. Sky’s life has never been simple—and it only gets more complicated. The Alphas, Ethan, and several key players in the otherworld go missing, thrusting Sky into the position of Elite Alpha and tasking her with finding them. The list of suspects grows as Sky realizes that her mating with Ethan has caused allies to become enemies. Will she locate the missing in time or will she be the last Alpha standing? Sky doesn’t know who she can trust. Too many people want her dead, including a new group of witches who want to rid the world of were-animals, especially those that who can wield magic like Ethan and Sky. Adding to the problems is a new group of vampires, who would do anything necessary to gain control in the Midwest by taking over the Northern Seethe, including hurting Sky’s friends. To ask other readers questions about Midnight Sky, please sign up. I can never get enough of this storyline and I wish so much it was not the last book in the Sky Brooks series! The characters have grown so much and the world building is so vivid and detailed I feel as if I can see everything in my mind as I read. I love all the humor and attitude, and no matter how dire the situation the pack always comes together, battered, scarred, and baring fangs, magic and intelligence! There is always more than one monster on the attack so who is the enemy and who is are I can never get enough of this storyline and I wish so much it was not the last book in the Sky Brooks series! The characters have grown so much and the world building is so vivid and detailed I feel as if I can see everything in my mind as I read. I love all the humor and attitude, and no matter how dire the situation the pack always comes together, battered, scarred, and baring fangs, magic and intelligence! There is always more than one monster on the attack so who is the enemy and who is are the allies... So much mystery intrigue and the long game coming to fruition in this perfect ending. As a reader, I was impressed as the story fell into place and ongoing machinations are exposed. It is masterful writing. The romance between Ethan and Sky that has been slowly simmering and smoldering finally comes to some incredibly tender and loving moments as barriers fall and they grow as a couple. All of McKenzie Hunters character dynamics are so multifaceted and fascinating. The characters are all realistically vibrant and I learned to love even the bad guys in this series. Yep empathy over choices is a real thing in this book and I love the emotional payoffs! 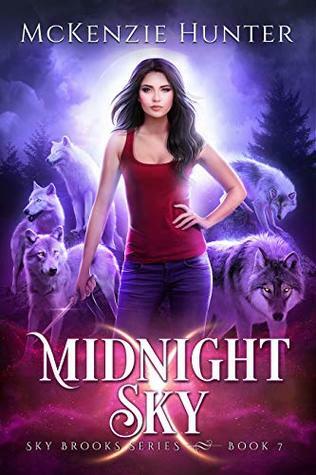 In addition, can I say the dialog between characters is priceless… Midnight Sky has moments filled with humor, bantering and sarcasm within the pack. You can feel a real closeness and comradery that a tried in fire team develops when facing life and death situations. So many things are explained/explored in this non-stop action packed ending to an amazing series. Well and it left me hungry for all that isn’t explained leaving a door open just in case McKenzie Hunter ever decides to revisit this world (and I so hope she does). What sets the Sky Brooks series apart is the relationships the characters have developed with each other over time they are believable and heartfelt. A nice addition is even when you feel like you understand a characters motivations you can still be surprised as new tidbits are revealed or revisited in conversations. I find this incredibly refreshing and I love how much detail is taken into consideration in not only the characters but also the overall plot. It is incredibly well planned out and executed. Bravo McKenzie Hunter this is a home run!!! I can't believe Sky and Ethan's story is over. I have so enjoyed being a part of their world. If you are looking for a series with a lot of heart then this is the best. Loved this final installment in the Sky Brooks series. I was everything I hoped it would be x10000. It was intense, funny, emotional, just a whirlwind. There were times I was gripping my tablet in angst, literally laughing out loud, crying real tears, just all the feelings. I think the best compliment I can give is that I was so sad when it was over, yet overly satisfied with the way things ended. I think this final book has quickly become my favorite of the series. I think this was by far the most action packed book in the series. So much happened! Other authors would have taken maybe two of the events in this book and dragged it out for 400 pages. I really enjoyed Ethan and Sky's relationship and banter...it has evolved to a point that we've all been waiting for. And the surprises in this book.... OMG. It's packed full of them. You don't want to miss this installment. From the very first page of the very first book, I knew I would read this story like an old friend! Comfortable, exciting, sad even exhausting is how I found Skylar Brookes. Beautifully written! A story well executed from beginning to end. Thank you for sharing you awesome talent with us McKenzie . You feel like my new best friend!!!! Love the way it was written so many things covered I was amazed. Glad thing turn out the way they did. I sad it's the end. Possible spin off or extra book would be good. Can't say how much I loved the ups, downs, back and forth all round awesomeness. Every book in this series has been amazing! This book was perfectly written to end all lose ties and provided the ending the series deserved. So many emotions reading this book but in the end I was happy. The plot and storytelling from this author is always wonderfully written with action, love, hate, revelations and character growth. This is so bitter sweet for me. One of my all time favorite series just came to an end. It is everything I imagined, and then some. I won't give anything away but if you have not checked out this series start from the beginning, and you will not be disappointed. I can't wait to see what Mackenzie Hunter has in store for us next! This was a well thought out conclusion. My only surprise or disappointment was how Cole’s role was concluded. After the massive build up it kind of happened early and quickly. Other than that I was a bit surprised about how the major threat was dealt with. I was expecting all out war, and instead it was quietly dealt with and everyone just went along with their lives. Good ending though overall. Reminder that you need to read the other books in the series before reading this one. This book is a great ending to the series. You will laugh, you will cry, you will want to shake some sense into Skye and Ethan. :) the only thing I didn’t like was the fact that Mekenzie made me like Chris and Demetrius more than I thought possible. This was such an incredible book. I still get all the feels thinking about it. But i want more from ethan and sky. We need one more book. It ended perfectly but still left room for more and I desperately want more. I haven’t been this blown away by a series in a really long time. Midnight Sky is the end? Skylar and the rest of the characters kept my attention throughout. I was worried about how the series was going to “end”. Many great twists and turns and a great choice of endings! This is one of the best series I've read. It was filled with lots of action, but also with the romance needed to keep intrigued. Thank you for your awe inspiring imagination. McKenzie's writting and with the witty banter from amazing characters, characters the you love, hate, or hate to love. This series was awesome. I love reading. McKenzie is definitely an author to watch...I suspect she has loads more coming. Loved this book and series. I have loved this series since I started it over a year ago. This is the perfect ending to this series. A delightful ending that satisfies the romantic hearts of the reader. A bit fast paced bu necessarily so in order to create the satisfying conclusion. Love this series! I hate to see it end. A phenomenal end to a phenomenal series. The best yet!! My favorite book of this series and McKenzie has become my favorite author as well. Every book I have read of her I have enjoyed so very much. It was the perfect ending to a great series. I have read almost all of Ms.Hunters's books and nothing can compare! I this series, these characters, I just disappear into the books, and finish them way too soon! McKenzie, as a child, discovered that her life could be a whirlwind of adventures by simply opening a book. To this day, reading is still her favorite activity. She has a fondness for fantasy and mystery, which is probably why she writes urban fantasy. When McKenzie isn't working on her next book she is usually binge-watching paranormal and comedy shows, maintaining her title as "favorite auntie", or trying to create a tasty low-calorie pizza. McKenzie loves to hear from her readers. Feel free to contact her via her website, Facebook, or email.